Colli Orientali del Friuli is one of the most important areas of regional oenology; it is approximately 2000 hectares and it extends from the municipal district of Dolegnano in the southern area, and all the way up to Nimis in the northern part of the region, bordered on the west by Slovenia. 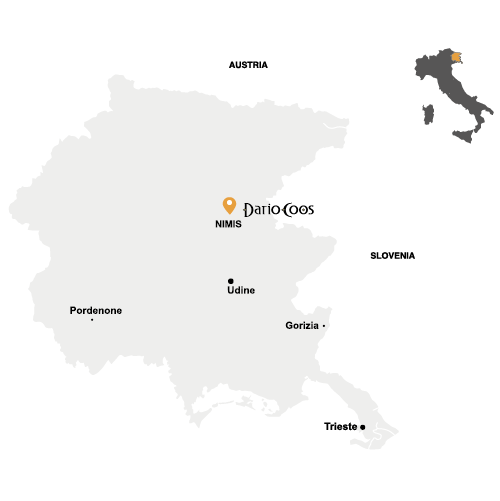 Our wine business Dario Coos is located right here, in a beautiful place with a unique climate that makes our wines iconic. The great savouriness of our wines is due to the high limestone content of the vineyards soil.It is a Eocenic marl, which is locally called “ponca”. Ramandolo is a unique location not only for the wonderful landscape but also for its microclimate. Light breezes blow every day, ensuring healthy and dry grapes; that is why brunches have been naturally dried by the wind for a very long time. Located in a natural amphitheater, our vineyards grow on steep terraces that can only be harvested by hand. Plant density is very high, reaching even 5000 vines per hectare.